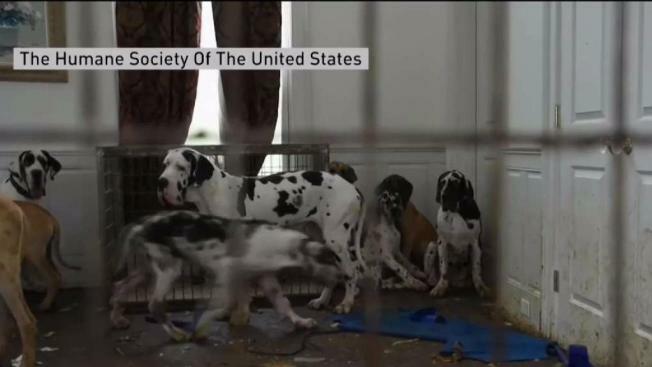 A New Hampshire woman will not serve time after more than 80 Great Danes were rescued from her home. A New Hampshire woman convicted of animal cruelty after dozens of dogs were rescued from her home won't face jail time. At a hearing late Thursday afternoon, a Carrol County Superior Court judge suspended Christina Fay's 12-month sentence with the condition that she goes to counseling two days a week. "I feel gutted," Fay told NBC10 Boston as she walked out of court with her attorneys and supporters. "I lost everything I love." Last June, police seized 84 Great Danes from her Wolfeboro mansion. Animal advocates say the dogs were living in filth, didn't have enough water or ventilation and some of them were very sick. Since then, six of them have died. The dogs have spent the last year being held as live evidence in a shelter created just for them by the Humane Society of the United States. "We're approaching $2 million to operate that facility," said Lindsay Hamrick, who was in court on behalf of the Humane Society. The judge ordered Fay to reimburse the Humane Society $1.9 million, plus any additional costs the organization will incur while rehoming the animals. The judge also ordered all 78 remaining dogs to be turned over to the custody of the state. "We are eager to get these dogs placed into loving homes," Hamrick said. "It'll be a year on June 16 that we've been waiting for that outcome." Hamrick says barring any further legal action, the dogs will be ready to find new homes before the end of the week. Fay's attorneys say they won't argue the rehoming order, but will be appealing the restitution.